The enthalpy of a chemical system refers to the "heat content" of the system. A reaction is exothermic when it releases energy, and ΔH = negative. A reaction is defined endothermic when it absorbs energy, therefore the ΔH = positive. The amount of heat evolved or absorbed in a reaction carried out at constant pressure is called enthalpy changes. It is given the symbol ΔH, read as "delta H". a pressure of 1 bar (100 kPa). Also, the compounds need to be present in their standard state. That is the physical and chemical state that you would expect to find it in under standard conditions. That means that the standard state for water, for example, is liquid water, - not steam or water vapour or ice. Oxygen's standard state is the gas, - not liquid oxygen or oxygen atoms. If a process can be written as the sum of several steps, the enthalpy change of the process equals the sum of the enthalpy changes of the individual steps. If we know the enthalpy changes of a series of reactions that add up to give an overall reaction, we add these enthalpy changes to determine the enthalpy change of the overall reaction. Where Σ ΔH indicate the sum of the change of enthalpies. Hess's Law is says that if you convert reactants A into products B, the overall enthalpy change will be exactly the same whether you do it in one step or two steps or however many steps. A reaction is exothermic when it releases energy, and ΔH = negative. On the other hand, a reaction is defined endothermic when it absorb energy, therefore the ΔH = positive. Scheme 1. 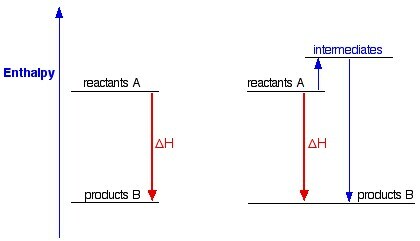 Graphic representation of changes of enthalpy in the reactions. Heat is a product of the reaction. Temperature of reaction mixture increases. Heat is a reactant in the reaction. Temperature of reaction mixture decreases. This shows a chemical reaction between the same reagents, producing the same products, but going through two different ways. In one case, there is a direct conversion; in the other, there is a two-step process involving some intermediates. As you can see, in either case, the overall enthalpy change is the same, because it is governed by the relative positions of the reactants and products on the enthalpy diagram. If you go via the intermediates, you do have to put in some extra heat energy to start with, but you get it back again in the second stage of the reaction sequence. This is true for any reaction. The symbol for a standard enthalpy change of reaction is ΔH°r. For enthalpy changes of reaction, the "r" (for reaction) is often missed off - it is just assumed. The "kJ mol-1" (kilojoules per mole) refers to the quantities of all the substances given in the equation. In this case, 98.2 kJ of heat is evolved when 1 moles of hydrogen peroxide liquid reacts to form 1 mole of water liquid and 1 moles of oxygen gas. Whenever a standard enthalpy change is quoted, standard conditions are assumed. If the reaction has to be done under different conditions, a different enthalpy change would be recorded. But this is a problem for another time. How do we calculate the change in enthalpy, ΔH, when 1.00 g of hydrogen peroxide decomposes in this reaction? First of all, we need to know the enthalpy change value, which is given here. If it is not given, there are tables indicating them. The thermochemical equation tells us that ΔH for the decomposition of 1 mole of H2O2 is -98.2 kJ. -The reaction can be reversed. This will change the sign of ΔH. -The reaction can be multiplied by a constant. -The value of ΔH must be multiplied by the same constant. Any combination of the first two rules may be used. Let's start finding one of the reactants or products where there is only one mole in the reaction. In our case, one CO2 and the first reaction has one CO2 on the product side. This gives us the CO2 we need on the product side and one of the O2 moles we need on the reactant side. To get two more O2 moles, use the second equation and multiply it by two. Remember to multiply the ΔH by two as well. Now we have two extra S and one extra C molecule on the reactant side. The third reaction also has two S and one C on the reactant side. Reverse this reaction to bring the molecules to the product side. Remember to change the sign on ΔHf. Therefore, the answer to our initial question, the change in enthalpy for the above reaction is -1075.0 kJ/mol.